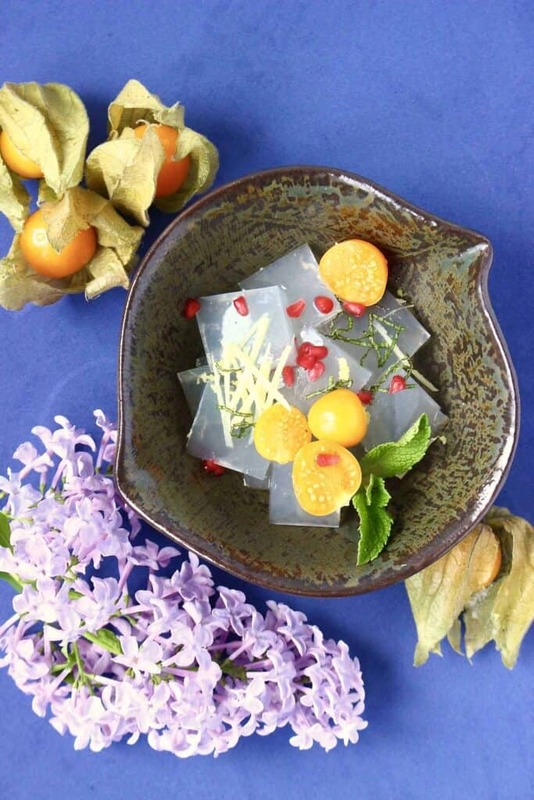 This Vegan Lemon Jelly makes a great light dessert, or if you’re feeling sophisticated, also doubles up as a refreshing palate cleanser. 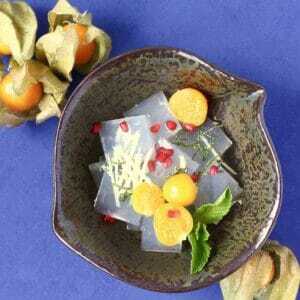 Just like this Lemon Tea, this Vegan Lemon Jelly was inspired by a yuzu jelly I ate in Japan. Yuzu is a Japanese citrus fruit, and although it’s delicious, it is hard to find outside Japan, so I decided to make a Lemon Jelly instead! The jelly is made vegan using agar, which is a natural jelly-like substance that comes from algae. It’s very healthy as it’s around 80% fibre. It’s used in many traditional Japanese desserts, such as anmitsu. You’ll be able to get hold of agar jelly in local health stores, Asian supermarkets, and maybe even your local supermarket too! The ginger syrup adds a warming, spicy and slightly piquant edge to the heady aroma of the lemon. It is completely optional though, as the lemon jelly alone tastes delicious by itself too. This Vegan Lemon Jelly makes a great light dessert, or if you're feeling sophisticated, also doubles up as a refreshing palate cleanser. To serve, cut the jelly into small cubes once it’s set, place in bowls and and pour over the syrup – add fruit and fresh mint it you want!